I was pleasantly surprised when I received this watch. The picture doesn’t do it justice, it looks bronze but, it’s beautiful rose gold. I have had a lot of compliments and nobody believes me when I tell them what I paid for it, would recommend to any women who likes this style watch. 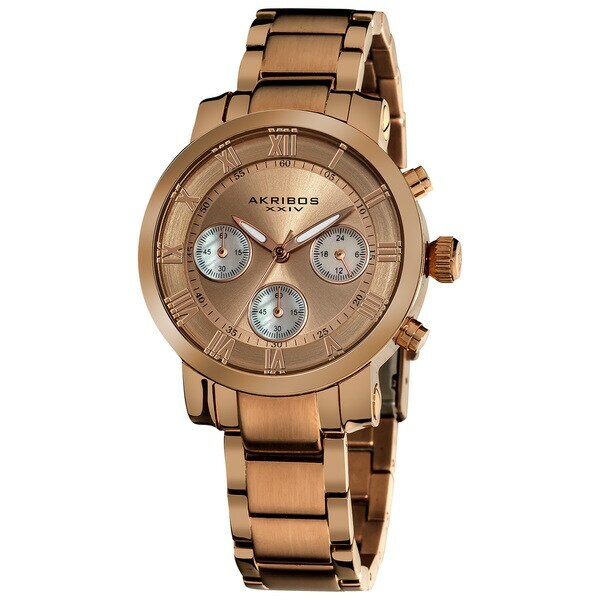 This classy, elegant Akribos XXIV ladies watch can add a touch of class to any wardrobe. With a solid stainless steel construction, this timepiece is sure to impress. It features Mother of Pearl subdials with 60 minute, 60 seconds, and GMT functions. I purchased this Beautiful Rose Gold watch for my son's girlfriend birthday. She loves pink and neutral colors and thought she would really like a rose gold watch to match her other rose gold earrings and necklace. The watch is very stylish and unique it was on sale for a excellent price at overstock. I like the way it looks. It has a good weight to it. Not too heavy to feel cumbersome and not too light to feel cheap. OMG! I love this watch! This exceeded my expectations by far and I am leaning on buying a silver one by the same brand. I would definitely recommend this to anyone looking for a watch. Although, I never did get the "Free Bangle" with the purchase. This is a great watch. I get so many compliments. A very elegant rich bronze color! very pleased. It looks nice but a little too big. Fun to wear - masculine if you like that style. I love the color, and it’s looks nothing like any Watch I’ve even own. Very different!